Officially known as the Royal Botanic Gardens, the spectacular 300-acre Kew Gardens is widely considered the world's most important collection of living plants. Situated in southwest London on the banks of the River Thames between Kew and Richmond, it also serves as an internationally acclaimed botanical research and education institution and employs over 650 staff. All told, Kew Gardens boasts more than 30,000 plant types, while it's impressive Herbarium (open to researchers only) includes a collection of over seven million specimens, many gathered by famous scientists and explorers such as Charles Darwin and David Livingstone. Founded in 1759, Kew Gardens - one of England's top tourist attractions with over two million visitors each year - is a wonderful place to spend a day, whether you're a fan of flowers or fantastic architecture, or simply looking for some superb green space to relax in. Kew Gardens is home to countless superb collections of plants, each handily contained in well-marked areas. Collections include everything from cacti to carnivorous plants, ornamental grasses to orchids, and roses to rhododendrons. While many of these collections are found outdoors (Britain's climate is perfect for gardening), there are also many collections to be found in Kew's many unique glasshouses. A relatively new addition to Kew, the spectacularly modern Alpine House reaches a height of 33 ft at its center and was designed specifically for plants capable of surviving at altitudes of up to 7,000 ft. Displays are frequently rotated, and include small ferns and lavenders, thymes and tulips, along with lesser-known species including the extremely rare Chilean Blue Crocus, once thought to be extinct. The stunning Palm House, along with the Temperate House (closed due to restoration until 2018), earned the architect and engineer duo of Decimus Burton and Richard Turner great acclaim at the time of their construction. The Palm House alone contains an astounding 16,000 panes of glass and many rare species of plant, including the double coconut palm (the plant with the world's largest seed), and a cycad specimen that's been in Kew since 1775. Opened in 1987 by Princess Diana, the Princess of Wales Conservatory is home to 10 unique microclimate zones and includes 1,500 species of tropical orchids and water lilies, including giant Asian specimens. Floor-level viewing windows also allow visitors a fascinating look into a variety of fish species, as well as piranha, tree frogs and water dragons. The hottest (and most humid) of Kew's many houses, the Waterlilly House was built in 1852 as a home for the largest species of water lilies. Some of which, like the Victoria amazonica, can grow many feet in diameter and live for decades. Kew's awesome Arboretum covers much of the property's 300 acres and includes a huge collection of hardy trees. 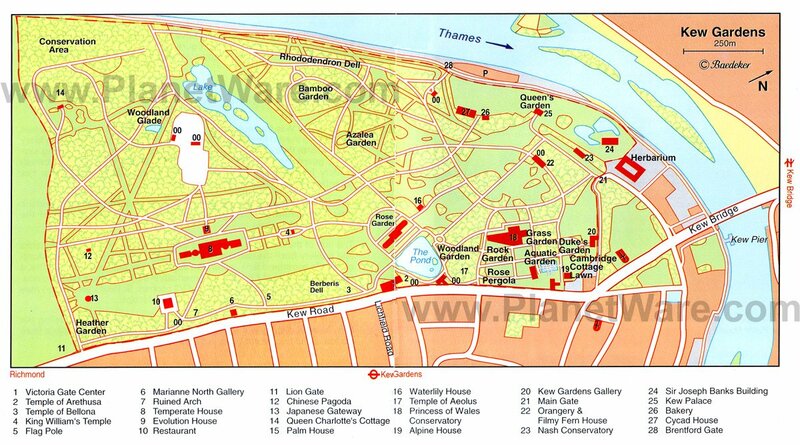 Divided into three regions, its sections include the North Arboretum with the original 1759 botanic garden; the West Arboretum with the Lake, Bamboo Garden and Rhododendron Dell; and the South Arboretum with its Berberis Dell and the grounds of Queen Charlotte's Cottage. The nearly mile-long Holly Walk contains the largest collection of mature hollies in Europe. Once a laneway that joined two former estates, this lovely walk includes many original trees planted in 1875. While most popular in late autumn, they do bloom with small white flowers in spring. In addition to its many superb collections of flowers and plants, Kew Gardens is also of great interest to students of fine architecture, whether your preference is for historic or modern day structures. Built for Queen Charlotte between 1754-1771, this quaint thatched cottage was a long-time favorite residence of Queen Victoria. The garden and woodlands remain just as they were in her time and include one of London's loveliest displays of bluebells. Also referred to as the Dutch House, Kew Palace - the smallest of Britain's royal palaces - was most famously occupied by George III during his fits of madness. The furniture, furnishings and art give a picture of the domestic life of the royal family in Georgian times. Of special interest are the wonderfully restored kitchens, along with the Queen's Garden with its collection of rare 18th century medicinal plants. Brought to Kew in 1911, the Chokushi-Mon (translated as the Imperial Envoy's Gateway) is a lovely not-quite-full-size replica of the gateway into one of Tokyo's holiest temples. The Minka House is a lovely traditional Japanese wooden house (or minka) originally erected in Japan in 1900 and reassembled in Kew's Bamboo Garden in 2001. The oldest of Kew's glasshouses, the Nash Conservatory was originally located at Buckingham Palace but was moved to Kew in 1836. This stunning piece of architecture, designed by John Nash and lovingly restored, is now used as Kew's educational center and is a must-see for its superb styling. Designed by William Chambers, the lovely Orangery was built in 1761 and for many years was the largest classical-style building in Kew Gardens. Built as a hothouse for citrus plants, it's now home to an elegant restaurant. Erected in 1762, Kew's spectacular Pagoda is 163 ft high with 10 stories, each of which has a projecting roof. The 253-step staircase is located in the center of the building, and although not normally open, it remains a focal point of the splendid gardens surrounding it. Kew Gardens contains a number of stellar art collections focusing on plants and flowers, as well as an interesting museum dedicated to gardening. As tempting as it might be to stay outdoors, be sure to take some time checking out these fantastic displays. Opened in 1882, the Marianne North Gallery pays homage to the artist after which this massive collection is named. The daughter of a politician, North travelled far and wide across North and South America, Asia and Africa in order to pursue her passion for painting plants and flowers. This stunning collection includes 832 of her paintings and is Britain's only permanent art exhibit dedicated to the career of just one woman. Opened in 1857, Museum No 1 (and in fact Kew's only museum) houses a superb collection of tools, clothing, food and medicines. Established to demonstrate our dependence upon plants, the collection includes some 83,000 specimens under themes such as Healing plants and Plants for Energy as well as rarities including a portion of a wreath found in the coffin of Pharaoh Rameses II. The Shirley Sherwood Gallery was the first gallery in the world dedicated solely to botanical art and includes work by the Bauer Brothers, Walter Hood Fitch and Georg Ehret (exhibits are rotated regularly). Kew Gardens is also a great place to entertain - and educate - kids of all ages. Adults, too, will love the many fun opportunities to explore the life of plants and related areas of "non-stuffy" study. Established in 1841, the Library at Kew Gardens boasts the world's most comprehensive collection of botanical reference books as well as more than 300,000 books and magazines, seven million letters and private papers, 200,000 pieces of art, and more than 200,000 photos. Kew has also done a superb job of ensuring that even its lowly old Compost Heap is of interest to visitors. Kew's compost is derived from waste from the gardens and the stables of the Household Cavalry and is used mainly in the gardens. A viewing platform - made of illegally harvested wood seized by British customs - offers a fascinating glimpse into the composting process, plus a chance to see Kew's resident peacocks enjoying the warmth the compost pile generates. Fun for the whole family, the excellent Treetop Walkway is 59 ft high and 660 ft long and extends across a lovely wooded area of Kew Gardens. A lift takes visitors to the start of the walkway (there are also stairs). This unique display provides visitors with a fascinating insight into what goes on underground to enable a tree to mature and grow, and includes a series of fun interactive screens showing the role of roots and soil in this lifecycle. Made from black granite and bronze, the spectacular Sackler Crossing spans the Lake at Kew Gardens and is noteworthy for its minimalist sweeping double curve design. The bridge is part of a trail network connecting the art galleries with the glasshouses and woodlands, as well as the Minka House. Excellent guided walking tours are available to visitors to Kew Gardens at no cost (daily, 11am and 2pm). A motorized tour is also available aboard the Kew Explorer, a fun "road train" that takes visitors on a circular tour around the property. A running commentary is provided, and you can exit the vehicle at designated stops. Tickets: If possible, you can save time by purchasing your tickets online. Garden Guides: An excellent series of guides are available for purchase (and sometimes for free) prior to your visit, including maps, apps and souvenir guides. Discounts for these guides are offered when purchasing tickets online. Food and Drink: Four food outlets are available at Kew, including quick snacks, kid-friendly restaurants and fine dining. Events: Be sure to check Kew Garden's online calendar prior to your visit for useful information regarding special events and closures. By Underground: Kew Gardens Station is connected to London's Underground network via the District Line, and is just a few minutes walk from the attraction. By Train: South West Trains operate direct to Kew Bridge Station from Waterloo (via Vauxhall and Clapham Junction). For further details, including special two-for-one admissions, visit www.nationalrail.co.uk. By road: Kew Gardens is well signposted from Kew and Richmond (the postal code for GPS systems is TW9 3AB). But, as is so often the case in London, public transit is convenient, inexpensive, safe and reliable. Parking: On-site parking is limited (£7 per day), and some free parking is available on Kew Road (A307) after 10am. Admission includes access to the grounds, gardens, buildings and attractions including Kew Palace, the Shirley Sherwood Gallery of Botanical Art and glasshouses. While a visit to Kew Gardens can easily swallow up the best part of a day, if you do find yourself in a position to explore a little further, you'll be well rewarded for the effort. Two excellent museums close by are the Kew Bridge Steam Museum with its collection of working steam engines, and the Musical Museum at Kew Bridge with its superb collection of automated musical instruments. The town of Richmond is also fun to explore, and offers many great opportunities for a riverside stroll along the Thames, as well as dining and shopping. Alternatively, if you haven't had enough of big open green spaces, pay a visit to the 2,300-acre Richmond Park, the largest city park in Britain and a popular spot for a picnic. Hilton London Syon Park: 4-star luxury hotel, beautiful grounds, gourmet dining, deluxe spa. Clayton Hotel Chiswick: mid-range pricing, excellent service, modern decor, underground parking, breakfast buffet. Premier Inn London Ealing Hotel: affordable rates, secure parking, comfortable beds. Travelodge London Richmond Central: budget hotel, helpful staff, near restaurants and shops.